Friday night, Sept. 14, the Harvest Moon Festival started with a Pre-Glow Celebration at Veterans’ Park in Stockbridge. 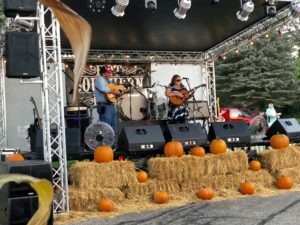 The Village of Stockbridge festival, sponsored by the Stockbridge Downtown Development Authority, began with a beer tent at Veterans’ Memorial Park and featured the band, Hot Southern Mess. Main Festivities will take place Saturday, Sept. 15, 10 a.m. to 11 p.m. The Kid’s Area at the Park will run 10 a.m. to 5 p.m. Enbridge is sponsoring Ultimate Air Dogs with a giant pool. Crafters on the Main (Street) will run 10 a.m. to 6 p.m., sponsored by Golling Chrysler Dodge Jeep Ram of Chelsea. Beer tent will run 5 to 11 on Saturday, featuring the ban Fool Fait, from 7 to 11. 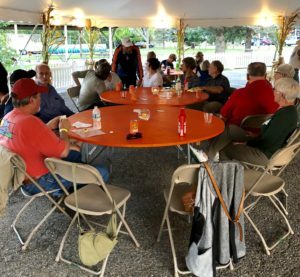 Local residents gathered Friday night, Sept. 14, for the Harvest Moon Festival’s Pre-Glow Celebration at Veterans’ Park in Stockbridge. 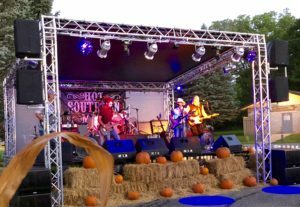 The Village of Stockbridge festival, sponsored by the Stockbridge Downtown Development Authority, began with a beer tent at Veterans’ Memorial Park and featured the band Hot Southern Mess. 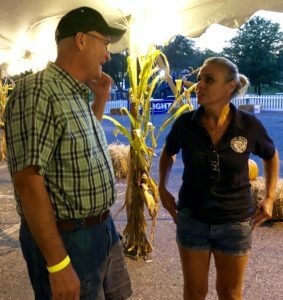 Stockbridge Village Trustee Richard Mullins congratulates and thanks Village Clerk Debbie Nogle for her masterful efforts in organizing of the event. As night sets in, the band’s lights pick up and the beer tent fills. Next: What kind of bug is this?